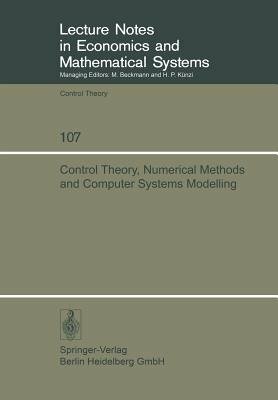 IRIA-LABORIA + has organized, this year, an International Conference on Control Theory, Numerical Methods and Computer Systems Modelling. This meeting which was sponsored by the International Federation for Information Proce s sing (IFIP) and by the European Institute for Advanced Studies in Management, took place in June (17-21) with the participation of more than 200 specialists among which 55 participants were repre senting 12 different countrie s. This volume of the Springer-Verlag Series "Lecture Notes" contains the lectures presented during the meeting and demonstrates the high interest of the research which is actually carried out in these fields. We specially wish to thank Monsieur DANZIN, Director of IRIA, for the interest he has shown for this Symposium, Professor BALAKRISHNAN who has arranged for IFIP to sponsor our meeting and Professor GRAVES, Director of the European Institute for Advanced Studies in Management for his support. The IRIA Public Relations has been of a great assistance to the Organization Committee and we wish to thank Mademoiselle BRICHETEAU and her staff for their contribution. At last we expre s s our gratitude to the Se s sions Chairmen and all the speakers for the very interesting discussions they have directed. A. BENSOUSSAN and J.L. LIONS +Institut de Recherche d'Informatique et d'Automatique Laboratoire de Recherche de l'IRIA PREFACE L'IRIA-LABORIA + a organise cette annee une Conference Internationale sur la Theorie du Contrale, les Methodes Nurneriques et la Modelisation des Systernes Informatiques.